My Christmas spirit has not been where it usually is around this time of year. Maybe it is the cold I have been battling. Maybe it is all the bickering going on in the world. Maybe it is – – just me. Anyway, after 3 days of just enjoying the snow, watching birds and playing with my “snowbears” (otherwise known as silly labradors), I decided to venture back into the world. There were lines of people in every store, lines of traffic, lines of snow banks, lines of Christmas songs singing through the noise, lines of cars waiting for one parking space, so it was not my favorite kind of day to be out-an-about. But then again, these are the days when My Father likes to yank my chain a bit as well. Just have to get my pesky, negative, whiney attitude out of the way and breathe deeply in my soul and stand back up. Two stores down, and I was at my last stop. By that point, I was not in the mood to even be there. I had already gotten my exercise in the other parking lots, so when I had to park a “fer” distance from this last store, I was beginning to have one of those whiney conversations with GOD that I tend to have when I am in my “poor-pitiful-me” frame of mind. Got out of the car to walk toward the store when a familiar song refrain surrounded me. It was Leonard Cohen’s “Hallelujah”. The words sang deep in my spirit, and there it was. A twinkle of Christmas light shining in my eyes. When I looked up, I realized it wasn’t a choir of angels singing the words, but a solitary, outdoor musician. 40 degrees. His black hooded sweatshirt pulled tight around his head as he played his amplified violin. His face full of concentration as his fingers moved over the strings. How he could play when the sun was hidden and snow piled around his feet was beyond me. His music followed me into the store, but I had lost interest in buying anything or standing in line. So – I walked back outside and stood there. Some children were also listening and talking softly with their mother. As she handed each of them a dollar, they smiled as they put a dollar in the violin case. Needless to say, I added a some as well. That pesky “attitude” that had been stealing my Christmas joy all day took a quick nosedive after that. In the car, I turned off the podcasts/newscasts/whatever and turned on the Christmas station. All the way home, I listened to Nat King Cole, Doris Day, Michael Buble, etc. sing with joy and perfection, but none of them could match glorious imperfection of the Christmas violinist. Joys of the season are sometimes hard to find amid the hustle and bustle of expectations and busyness. So tonight, I am thankful.Thankful for a man who stood on a busy sidewalk and shared his gift of hope and joy with the world. Today I gave him some money, but tonight, I am putting a prayer in his violin case. A Christmas prayer that all his dreams come true and that he continues to bless the world with his gift. This day just did not go anything like I wanted it to go. Went here – went there – turned around and went in circles round and round and round. I’ve already decided that tomorrow I am just staying home. Napping is on the agenda. Watching Hallmark movies until my eyes cross. Holding Koay so she won’t run. Curling into myself and just holding on to this little bit of heaven on earth and above all – being thankful for swings. Growing older has its advantages. Gathered wisdom starts to assert itself, and you realize that ranting and raving over anything really isn’t beneficial to anyone – especially yourself. So late this afternoon when I got home from this absurdly frustrating day, I let our gimpy Koay, her bouncing sister Ryndi, and playful urchin kitty, Shadow accompany me outside while I sat on our swing. Something about a swing rocks my world. Seriously – no pun intended. Maybe it is the return to the rhythm of my mother holding me long ago – or the way I rocked my own children. Swaying with them in my arms while I talked with friends. The swings on a playground or in a park. The WWII Marine hammock under my Thinking Tree. The rope swing my daddy hung in the walnut tree in our front yard. Whatever the physical reference, it is the spiritual “rock” to which I cling. Close my eyes. Breathe in the quiet of the neighborhood. Until the music returns within me, and I began to sing. The old hymns surface “Come Ye Thankful People, Come” “Holy, Holy, Holy”, “Jesus Loves the Little Children”. Thankful today for all the swings in my life – my little bit of heaven on earth. Back in the ol’ days when families were large and relatives rarely moved further than 30 miles away, cousins were part of the fabric of our lives. They were at our home or we were at theirs. We played. We went to church together. We played again. Their parents babysat us for various reasons. We played and played and played. We went to family reunions. Where – you guessed it, we played some more. We were family. This has been a week full of sentimental journeys. Sentimental journeys that included my cousins. I LOVED going to my cousins’ homes – whether for a week of “camp” (while Mom and Dad had their own “vacation”) or just for a day of family “get-together”. Didn’t matter if we only went across town or drove for an hour. It was a “cousin” adventure. This week has been one of those weeks when the bittersweet memories have drifted across my brain on a fairly regular basis since I’ve been recovering from an inner ear infection. Most times, I don’t have a great re-call of my childhood. Not sure why, but when something triggers a memory, I am blessed with some tears and a smile. This week one of my cousins decided to join the rest of the McCaskey clan in heaven so the trigger was pulled back. Got my bag, got my reservation. Mike was one of those baby cousins that I tended to ignore on most of our visits. One – he was a boy. Two – when he was born, I was entering my teen years. Except for getting paid for babysitting, I didn’t care much for babies. They are cute, but they don’t do much. I remember Aunt Nancy’s house because there were lots of cousins, there were babies, and there were bunk beds. Bunk beds, to my way of thinking, were the absolute wonder of the world. There was lots of space to run outside. There were new games of pretend to enact. And – they got 2 more TV stations then we did – or maybe they just got a different station then we did. After all – homes that got 3 stations all the time were hard to find. Pretend games of being a flying horse who could change into a human was my favorite. But one time, when the McCaskey sisters had a mini reunion at Aunt Nancy’s house and all the cousins were there, the 3 girl cousins decided to take on the way too many boy cousins. I remember we blockaded the bedroom door and were jumping from bunk bed to bunk bed. I was a midnight black panther who, of course, could change into a person. Eventually, I was set loose from the confines of the bedroom and led the chase of all who dared torment us. How it ended – I have no idea. I just remember the chase, the laughter, the meals, and the love of family surrounding all of us as we fought, played, fell on each other and prayed together at night where I got to sleep in one of those dreamy bunk beds. Sentimental journeys always bring a treasure forward in this crazy brain of mine. Bittersweet or not – I love walking backwards for a short time and just letting the memories push me towards home. Never thought my heart could be so ‘yearny’. What can I say – it’s a High School Musical type of night. Can’t help but smile, can you? And yet – – – some of you are sighing. The world’s people could choose to dance instead. We could choose to find the hidden talents in each other. We could choose to not bully others to think the way we do. We could choose to throw away the team playbook or the dramatic clipboard. We could choose to reach out our hand to those standing beside us. We could choose to sing in harmony and create our own movie musical – – a World Musical – – a Garden Musical. This is the week, I really tend to start centering in on the humanity of the Holy family and the journey they actually took I mean – really? Walking and/or riding a donkey for 60 – 100 miles (depending on the probable routes of the times) in the last week of pregnancy has to be the ultimate ‘I-don’t-wanna-do-this-ever’ for new parents. And yet – somewhere deep within me – I know they didn’t even question it. You have to figure that Mary and Joseph came from families that were immersed in scripture study. Visited by an angel – covered by the Holy Spirit – visited by another angel – Mary and Joseph knew scripture. They knew the prophecies – they knew that their son, Yeshua, would be born in Bethlehem – even before a Roman emperor told them that they would have to journey there to be counted. Sometimes over the years, I’ve wondered if they thought that God would open a miraculous door, and they would find a place “fit for a king” waiting for them when they got to Bethlehem. I’m pretty sure that Abba didn’t fill in a lot of details for them any more than He does us when He pushes us out the door on our own journeys. As I study the scriptures, El is great at pointing the way, but expects us to travel on faith most of the time. I guess you can tell, that is not always my favorite way of embarking on a journey. I’m still working on that particular aspect of my character. However, as I read over the last couple of paragraphs again, the proverbial light bulb went on in my sometimes functioning mind. Bam!! It made sense. His parents had to travel their own mirror journey of what Christ’s path would reflect. How could they “train up a child the way he should go…” if they didn’t understand what hardships might lie ahead in His earthly, humanoid journey. Today, hubby put on his shorts and took his own journeys. He ran the four-wheeler, the scooter, the motorcycle and walked the dogs. I worked on Christmas stocking #3, cleaned the garage, delivered a pine decoration to a neighbor and lit the final Advent candle. We are blessed. Prayers circle. LOVE arrives as a baby. Merry Christ-mass. Seek the infant. First – you have to love a place where you can browse 30-50 free books whenever you want. 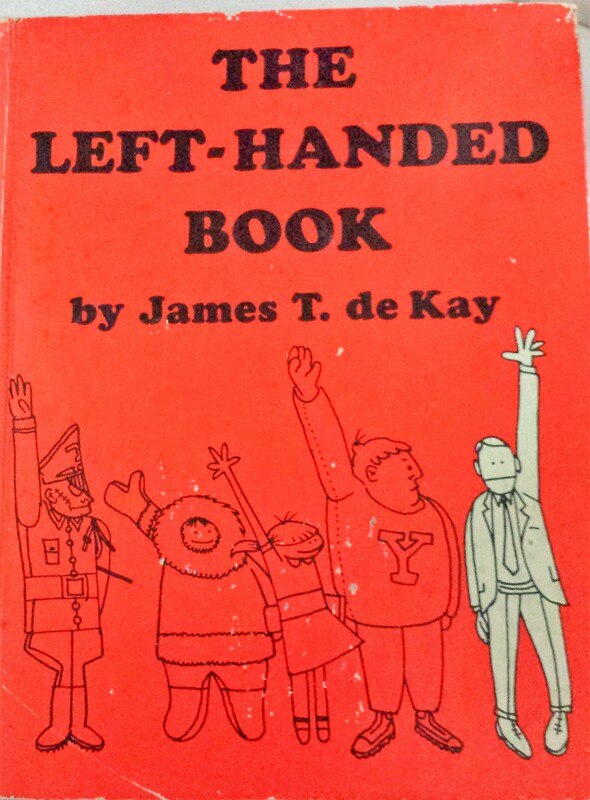 Second – you have to love a book that is titled “The Left-handed Book”. Well – you do have to admit that if you were a left-handed, retired English teacher/reader named Bryn you would definitely have to consider “loving” these three things. Somedays, you just go where ever the road takes you and just chill. Today I didn’t unpack one box – – – or move things around – – – or decide where to “permanently” place things for the remainder of our duration in this home. Didn’t clean anything. Didn’t blow leaves out of the garage. Didn’t do much at all. 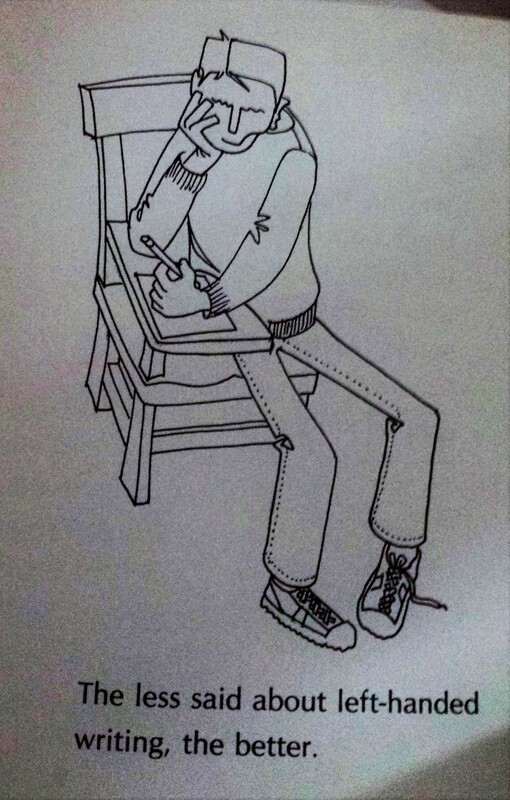 Being left-handed was never a problem for me – except for one teacher in elementary school – who made sure I knew that she thought all left-handers should have been changed back in kindergarten – never did get above a “C” in handwriting in her class. I did have to work hard at learning how to use scissors, sit in right handed desks, write in straight lines on a chalkboard and twirl a baton good enough to match the other girls. And when frustrations turned to tears,I had a mother who slapped me upside the head and said, “God made you exactly the way you are supposed to be in this life, and if you quit you aren’t trusting Him enough”. Can’t argue with that kind of logic. Can’t give up with that kind of mother either. Some day, I will pass this funny little book on to my left-handed granddaughter. Together, we can laugh as I explain how it was in the “old” days. Always such a fun thing when we can pass on our history or share how to do things with a leftie twist. It is another link in Our Father’s family chain of life that just keeps growing longer and longer and longer.